Today I’m curious of what www.internetexplorersucks.com look like, I typed it and it redirected to http://www.mozilla.com/en-US/firefox/. It’s like the website http://www.ie7.com/ where it tells the user to get Firefox, although they’re not affiliated with Firefox, they’re just created by fans who want people to use Firefox instead of IE. Autosurf is a good way to increase your site’s traffic, it works by you visiting other people’s sites automatically in exchange for other people’s visits, sites are shown for a specific amounts of time then rotates afterward. Once you start the autosurf window, you can sit there to watch each websites that it shows up or you can go to do something else. There are many autosurf websites available, you could just google search “autosurf” to find them, the good ones can even get over hundreds hits(unique and non-unique) per hour. But some of them shows sites that load too many stuff that freezes the browser, or cheating sites like frame breaker, which redirect the page on the top frame, thus breaking the rotator’s frame. 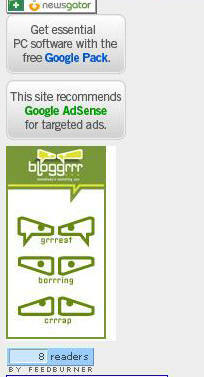 Note that the traffics generated by autosurfs are artificial traffics, people usually won’t look at your websites, if you want your website to be seen by other people you should try Manual Traffic Exchanges like iLoveHits, FastFreeway, or BlogExplosion, they require the user to verify before switching to other websites instead of done automatically. For high quality version please see http://www.firefoxflicks.com. Did you see the annoying “Click to activate and use this control” message sometimes when loading a page? Firefox will never have this problem. You can effortlessly do things in Firefox that IE users only dream about, Switch to firefox now for a better browsing experience and browse the web more securely. 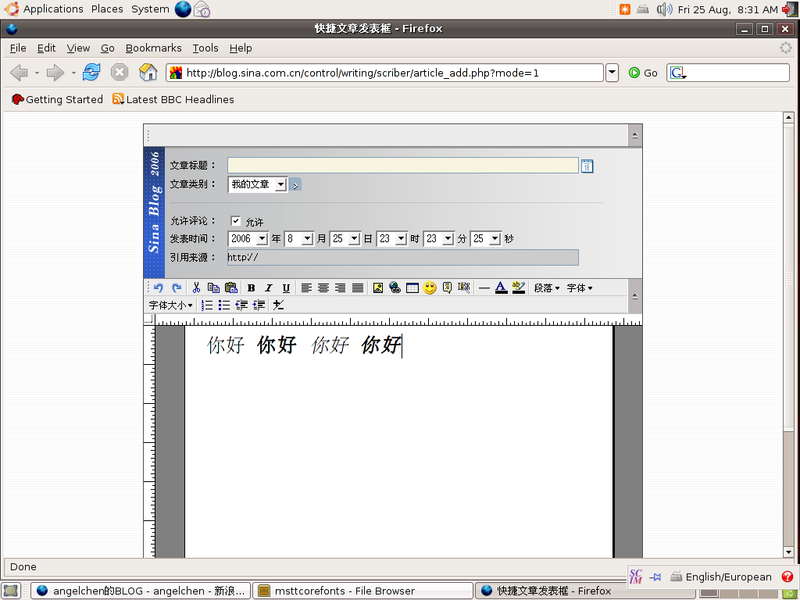 With Ubuntu Dapper you can make Linux to display Chinese fonts (or maybe for other languages as well) much much easier than before. 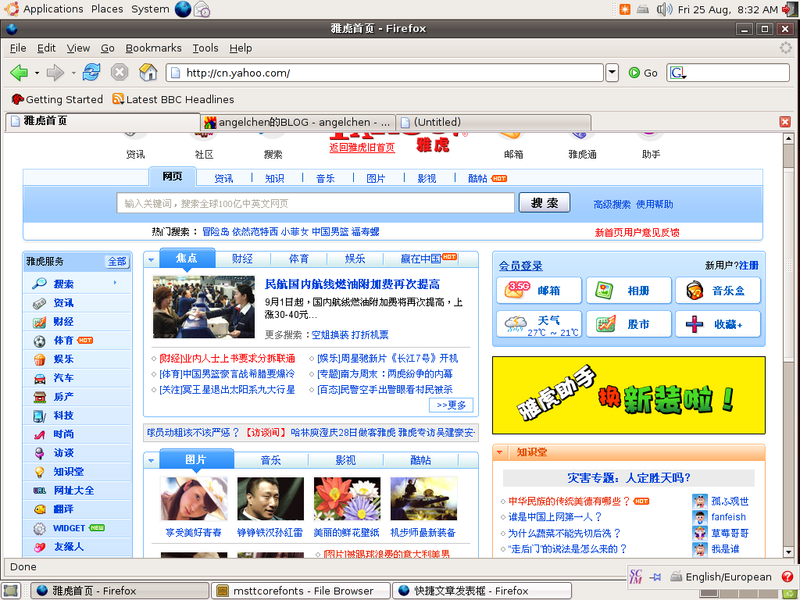 After you read this you’ll find out to make Linux to display Chinese well can be as simple as this. Get the font Simsun.ttc from Windows or some other high quality Chinese fonts and put them in the folder /usr/share/fonts/truetype. Update the font cache by runing “sudo fc-cache -fv”. Last and not least run the command “sudo fontconfig-voodoo -f -s zh_CN” and you are done! restart X and check it out. Explorerdestroyer.com provides HTML code to detect if a user is using Internet Explorer, if he does, then a message that says ” We see you’re using Internet Explorer. Try Firefox, you’ll like it better. ” will pop out, it also tells us about the advantage of switching to firefox and the user to click the button on the right to download Firefox with Google Toolbar, which is your own adsense button. As always if a user liked it, downloaded firefox by clicking the button and installed it you’ll get $1.00 commision. I’ve seen couple of website loaded with it. There’s three levels of setting available: Gentle(Level 1), Semi-serious(Level 2), and Dead-serious(Level 3). Level one just display a message and the download button on the top of page if a user is using IE; level two displays a splash screen with a message, a download link, and a link that you must click to skip the message and continue to the website; level 3 won’t even let you go in the site unless you use firefox, but because of this you have to use a non-adsense button for the download link, adsense’s policy doesn’t allow people to force others to click the ads. For more information and demos please see http://explorerdestroyer.com/.